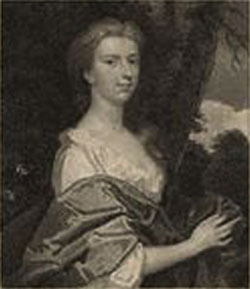 Henrietta was the daughter of the irascible Sir Henry Hobart of Blickling Hall in Norfolk and Elizabeth, daughter of Sir Joseph Maynard, an eminent judge. Her father was killed in a duel in 1698 and her mother died in 1701 at Gunnersbury House in Middlesex. There were financial problems at Blickling and Lady Hobart had sought and received help from a Maynard cousin, the Countess of Suffolk, so she and her eight children were enabled to spend time at Gunnersbury. This brought Henrietta into contact with the Earl's youngest son, Charles (1675-1733). Marriage followed and their only child, Henry, was born in 1707. Charles, an officer in the Dragoons, was a quarrelsome and violent drunkard who gambled unsuccessfully to the extent that he squandered Henrietta's marriage settlemant and was obliged to sell his commission to pay his debts. By 1713, in poverty, Henrietta decided to seek employment for herself and Charles in the court of the Electress of Hanover at Herrenhausen. With considerable difficulty She organised the move, which meant leaving their son behind in England. The Electress Sophia, at the age of 84, entertained hopes of succeeding Queen Anne on the throne of England and, charmed by Henrietta made her in effect a lady-in-waiting. The Electress died a few weeks before Anne, in 1714, and her son George became King of England. Henrietta had become friendly with his son, George Augustus and his wife Caroline and following his father's accession she obtained a position as a Woman of the Bedchamber to Caroline, now Princess of Wales. Charles managed to obtain a position in the household of the new King. Henrietta had now achieved a degree of financial security and, perhaps inadvertently, she also become the mistress of the Prince of Wales. She moved with the Prince’s Court, after his expulsion from St James’ Palace in 1717, between Leicester House and their summer home at Richmond Lodge. In the King's absence abroad in 1716 they moved to Hampton Court. Charles remained at St James's Palace with their son: Henrietta never saw Henry again. In 1723 the Prince of Wales made a settlement on Henrietta giving her financial independence in a fashion that could not be pillaged by her husband. £11,500 in securities, various gifts and the furniture from her apartments at Leicaster House and Richmond Park and a cargo of mahogany from a ship became hers. The money was in trust and so protected from Charles. She decided to build herself a house. 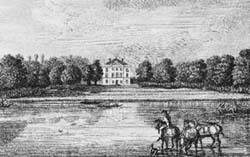 Land was identified on the riverside at Twickenham and purchased through the enterprise of the Earl of Ilay, one of the trustees. The house, known as Marble Hill House was built, starting in 1724. It was only completed in 1729 following an interruption occasioned by the death of George I in 1727. The accession of the Prince of Wales to the throne as George II gave Henrietta, as his mistress, greater prestige at court. Thus she became the unwelcome recipient of approaches by those seeking royal favours. She was also increasingly weary of her menial duties as a Woman of the Bedchamber, not to say the constant bullying from her husband, ever eager to get his hands on her money. In fact her relationship with the King was now fading, although in recognition of her marital plight he provided financial assistance which both enabled her to buy off her husband and to finish construction at Marble Hill. Then. in 1728, following agonised consideration she was able to obtain a legal separation from Charles, leaving her, effectively, a free woman. Charles became Earl of Suffolk in 1731, his older brothers having died. Henrietta was now the Countess and, by convention, of too high a status to remain merely a Woman of the Bedchamber. Caroline appointed her Mistress of the Robes, an altogether less demanding position in the royal household. Finally, in 1734, her relationship with the King at an end, she was able to resign this position and, with a pension of £2000 a year, enter on a life of her own. Charles had died in 1733 and she was now free from him, too. She was also free to marry again and, in 1735, she married George Berkeley, marking the start of what were probably the happiest eleven years of her life. Henrietta and George were devoted to each other, finding it unbearable to be apart. Unhappily this period ended with George's death in 1746. In 1735 she bought the lease of a new house in Savile Street (now Savile Row). She enjoyed the challenge of fitting it out as much as she had with Marble Hill. It provided her with a base in London, more readily accessible in winter for her circle of friends. In Twickenham she had a small court of her own with friends such as Alexander Pope, Gay, Dean Swift (for a while), Lord Chesterfield and, in later years, Horace Walpole, who greatly enjoyed a gossip with her. .
By now Lady Suffolk was considered the model of decorum and she undertook in later years the upbringing of her great-niece, Henrietta Hotham. Pope had praised her as "a reasonable woman handsome and witty, yet a friend". Lord Peterborough wrote a song in praise of her. Walpole added her name to his Twickenham Register of 1758 and on her death in 1767 wrote a a moving letter to Lord Strafford on 29 July bemoaning the loss of a most agreeable friend...It is due to her memory to say, I never saw more strict honour and justice. She bore knowingly the imputation of being covetous at a time that the strictest economy could by no means prevent her exceeding her income - the anguish of the last years of her life though concealed, being a desire not to be in debt, and to make provision for Miss Hotham [her great niece]. When George II died in 1760 Henrietta's pension ceased. A certain shortage of money, increasing deafness and ill-health marked the last years of her life. Finally, in the evening of 26 July 1767 she died at Marble Hill. She ws taken o be buried next to her second husband, George Berkeley at Berkeley Castle.